She's so into holding things, piling them up, stacking, then moving them away. She'll do this for several minutes with just two dishtowels. Moves one at a time to her lap, then moves them away... then sometimes she'll scoot around a bit, and then start over. Pretty cute. Here she's doing it with leaves. 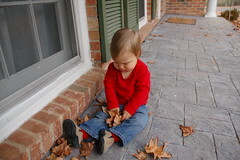 This is after she first tried to clear off the porch area one leaf at a time.